Okay, so the kids have outgrown High-FIve and the Make-A-Mask and woodworking activities you used to take them to, but you don't want them spending all their holidays staring into the chasm of a computer screen. And whether or not they'll admit it, they don't want to either (well, not ALL the time). Here's some ideas for special activities for older kids over the holidays to get them out and about and having a whale of a time, regardless of the weather. For a REALLY fun run around in the bushes/mazes, without the bruising and pain of paint-ball, try laser-tag, either indoors or outdoors. 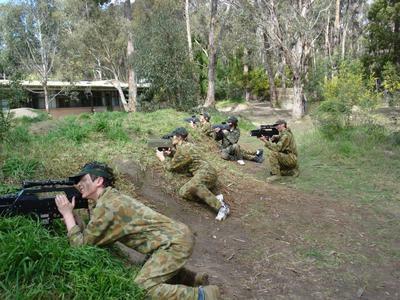 My family's favourite is Laser Strike and there is a list of laser-skirmish sites throughout Victoria here. and if the weather is just too foul to consider roaming outdoors, there are lots of indoor laser-tag options too. Check out the Icehouse in Docklands for endless hours of screaming, skating and falling on bums - best wear VERY warm and fairly waterproof clothing. We can also recommend the free wrist and knee guards for beginners. They have ice-skating to the Top 40 on Friday nights and ice-discos on from 7pm each Saturday for those who need to get their inner-boogy out. Over the school holidays they also have ice-tubing rides - and older kids can even get involved in the ice-hockey. 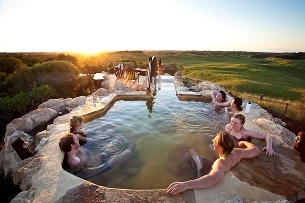 A huge hit with the teenage girls, the chance to wallow and gossip all day long in the steaming hot outdoor pools is their idea of heaven. And it's not too onerous for the mums who have to take them either...! Slouching through the movies - what's not to like! The Bean Bag cinema at Hoyts in the city is a huge hit with the teenagers, and can even be hired out for parties. Nothing like a hit of adrenaline mixed with thrill/fear to keep your young folks focussed. 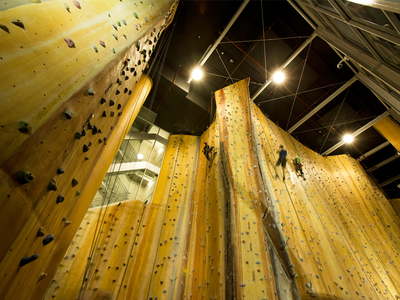 Indoor rock climbing is safe, fun and challenging, and for those who don't like heights, bouldering (where you climb along a wall only a metre or so off the ground, instead of up a very steep wall) is just as much fun. Get a group of kids together. At Hard Rock in the city or Nunawading, kids from age 4 can climb, but over the age of 11 can be taught safe rope skills and how to anchor/belay their friends - nothing like a sense of obligation between mates! Ten-pin bowling is an old fashioned favourite that has been updated with disco-lights, cool little animations on the scoring screens whenever you get a strike or spare and usually some dark, thumping music. Get a group of teenagers together in adjoining lanes, a bit of a competition going, and they'll have a hoot. There are lots of bowling alleys throughout Melbourne. Try any of the AMF Bowling Centres or Strike Bowling. What about getting some friends together and getting them out on the trail to do a bit of horse whispering? Tonimbuk Trail Rides, based in Springvale, takes groups of absolute beginners out on rides from 1 hours to full days, through the beautiful Bunyip State Forests. It may be cold outside, but when have kids ever felt the cold? Certainly not in the indoor tropical environments of Melbourne's wave pools, which are fantastic places to burn off some energy! Try the Melbourne Sports and Aquatic Centre in Albert Park which also offers 'Flowriding' in addition to a big wave pool and water slides. Have you ever noticed how loud teenagers are? And especially how loud they are when they have headphones on, singing along to their iPods, oblivious to the world? Well, if you have a budding Katy Perry, One Direction band member or Ed Sherrin in your midst, get them off to a karaoke centre, where you can book private rooms for up to 35 people to yodel to their hearts content from 1030am in the morning! 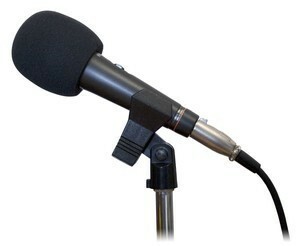 Try Strike Karaoke at the QV Centre, Glen Waverly or Bayside. Take it a notch up from board games. The young (and not so young) people who understand their gaming, take the miniature figurine strategy games of Warhammer and Lord of the Rings very seriously indeed, but there is also lots of fun to be had, with a thriving sub-culture. 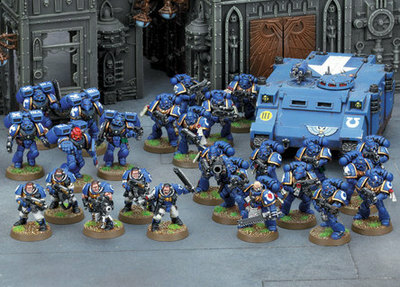 Games Workshop, which has shops across the world, offer lots of free school holiday activities from model making and painting to major tournaments. When your enthusiastic teens have finished trashing your kitchen with their latest cupcake rendition, try sending them out to one of the many fantastic cooking classes on offer. Relish Mama, in Sandringham, is one of Melbourne's Top 5 cooking schools, and runs dedicated 'Teens and Tweens' classes throughout the school holidays. Dessert and past cooking classes for teens are all the go at the Queen Vic market cooking school over the holidays. 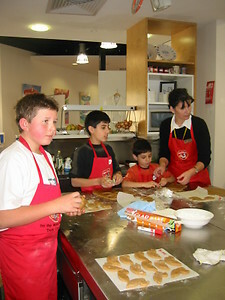 Luv-a-duck in Port Melbourne also offer specialist duck-based cooking classes for children twice a week. As my own teenagers said, 'a good finish'. Never underestimate the innate ability of teenagers to while away endless hours just 'hanging out' together - perhaps their ultimate pleasure. This is just WOW, thank-you so much, my kids are full of excitement.